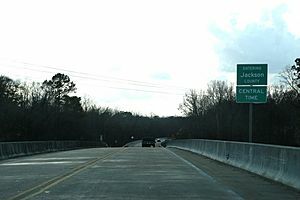 Jackson County is a county located in the U.S. state of Florida. As of the 2010 census, the population was 49,746. Its county seat is Marianna. Jackson County was created by the Florida Territorial Council in 1822 out of Escambia County, along with Duval County out of St. Johns County, making them the third and fourth counties in the Territory. The county was named for Andrew Jackson, who had served as Florida's first military governor for six months in 1821. Jackson County originally extended from the Choctawhatchee River on the west to the Suwannee River on the east. The county had been reduced close to its present boundaries by 1840 through the creation of new counties from its original territory. Minor adjustments to the county boundaries continued through most of the 19th century, however. There were no towns in Jackson County when it was formed. The first county court met at what was called "Robinson's Big Spring" (later called Blue Springs) in 1822 and then at the "Big Spring of the Choctawhatchee" in 1823. The following year the county court met at "Chipola Settlement" which is also known as Waddell's Mill Pond. Marianna became the county seat, but not without controversy. It was founded by Robert Beveridge, a native of Scotland, in September 1821. The first town established in Jackson County was Webbville in January 1821. Webbville, a community of land squatters, was located 9 miles (14 km) northwest of present-day Marianna and was designated as the county seat. Webbville thrived until 1828 when Beveridge and other Marianna settlers went to Tallahassee and enticed the Florida Legislature with free land, construction of a courthouse, a public square and $500 to purchase a quarter section of land to be sold at public auction as a way to finance the new government, if the county seat was moved to Marianna. Beveridge and his supporters succeeded and Marianna became the county seat of the county justice and civil authority, even though it was never officially proclaimed the county seat. Marianna began to grow and prosper when the county government moved into the new courthouse in 1829. Webbville's prominent citizens moved to Marianna and the L&N Railroad decided to bypass the town. Webbville does not exist today. From 1869-71, Jackson County was the center of a low-level guerrilla war known as the Jackson County War. Members of the Ku Klux Klan consisting of Confederate Army veterans assassinated over 150 Republican Party officials and prominent African-Americans as part of a successful campaign to retain white Democratic power. According to the U.S. Census Bureau, the county has a total area of 955 square miles (2,470 km2), of which 918 square miles (2,380 km2) is land and 37 square miles (96 km2) (3.9%) is water. Jackson County is the only county in Florida that borders both Georgia and Alabama. Jackson County is in the Central Standard Time Zone. Its eastern border with Gadsden County forms the boundary in this area between the Central Standard and Eastern Standard Time Zones. As of the census of 2000, there were 46,755 people, 16,620 households, and 11,600 families residing in the county. The population density was 51 people per square mile (20/km²). There were 19,490 housing units at an average density of 21 per square mile (8/km²). The racial makeup of the county was 72.18% White, 24.56% Black or African American, 0.77% Native American, 0.46% Asian, 0.03% Pacific Islander, 0.61% from other races, and 1.40% from two or more races. 2.91% of the population were Hispanic or Latino of any race. There were 16,620 households out of which 30.90% had children under the age of 18 living with them, 51.50% were married couples living together, 14.40% had a female householder with no husband present, and 30.20% were non-families. 27.00% of all households were made up of individuals and 12.80% had someone living alone who was 65 years of age or older. The average household size was 2.44 and the average family size was 2.95. In the county, the population was spread out with 22.30% under the age of 18, 9.70% from 18 to 24, 29.60% from 25 to 44, 23.80% from 45 to 64, and 14.60% who were 65 years of age or older. The median age was 38 years. For every 100 females there were 110.40 males. For every 100 females age 18 and over, there were 111.20 males. The median income for a household in the county was $29,744, and the median income for a family was $36,404. Males had a median income of $27,138 versus $21,180 for females. The per capita income for the county was $13,905. About 12.80% of families and 17.20% of the population were below the poverty line, including 23.70% of those under age 18 and 21.00% of those age 65 or over. The Jackson County Public Library System has two branches. Jackson County is also a part of the Panhandle Public Library Cooperative System. The PPLC also includes Holmes, Calhoun, and Washington counties. Jackson County's main airport is Marianna Municipal Airport, originally known as the Graham Air Base. Local and private airports also exist throughout the county. Jackson County has at least two existing railroad lines. The primary one is the CSX P&A Subdivision, a line formerly owned by the Louisville and Nashville Railroad that served Amtrak's Sunset Limited until it was truncated to New Orleans in 2005 by Hurricane Katrina. Another one is the Bay Line Railroad, a line that was originally the Atlanta and St. Andrews Bay Railway main line, and runs along US 231 from Panama City through Campbellton. The lines contain a junction with each other in Cottondale. Other lines within the county were abandoned. Jackson County, Florida Facts for Kids. Kiddle Encyclopedia.